Tonight it's finally here, the long-awaited BCS Title game with Auburn taking on Oregon. There's plenty of future NFL talent that will be lining up on both sides of that one. Both teams have shown the ability to come back from deficits (Auburn from 24-0 at Alabama, Oregon from 21-3 home vs. a very good Stanford team) and it will be intriguing to see how it plays out. Will Oregon play any mind games with Auburn by putting pictures of the Yella Wood guy or Milton McGregor on their sideline signs that signal in plays? We shall see. The decision by Andrew Luck to return to Stanford for his redshirt junior season shook mock drafts across the world. His timing was decidedly inconvenient for me, as I was putting the finishing touches on my first Luck at #1 mock (I was one of the last holdouts on that) when word leaked on Luck planning to return to Stanford. So I had to start from scratch from the top. So it goes in the world of mock drafts. There is some debate now about who Carolina will take at #1, but it's way too early to know for sure, particularly with the team without a head coach. The Panthers have been looking at defensive coordinators for the job according to published reports, both 3-4 (Rob Ryan) and 4-3 (Perry Fewell). If a 3-4 guy comes in, the odds of the team drafting Clemson DE Da'Quan Bowers drops considerably, since he would need to shift to OLB in that set and likely not be worthy of top pick status. Florida fans have to be happy with Will Muschamp talking CB Janoris Jenkins into returning to Gainesville for his senior season. I had anticipated that he would be the third corner to go in the draft, likely in the mid-late first round, though he could have fallen to round two or even three depending on how his workouts went. Now he'll have another season to show off his skills and perhaps land a better draft position for the 2012 NFL Draft. Of course, a new mock at the end of the NFL regular season brings in reader feedback, which is part of the fun of this time of year. You have the Patriots taking an RB and a WR in the first rd......................What are you drinking..............The Patriots first six picks will be a S - CB - DE - OLB - OL - OL the order will depend on who is on the board when they pick.....................They may go after an RB and WR in the 4-5-6- rds or look at free agents or wait until the 2012 draft. Lou: I like Crown Royal Black whiskey, but I suspect the question about what I'm drinking was rhetorical. There's a fair point to this argument though, particularly when New England's needs are considered. Offensive line would be a wise spot to target, though the Patriots are famously difficult to predict because they keep their plans close to the vest even by NFL standards and also their means of projecting players often differs from how many scouts project things. My anticipation is that the Patriots will trade down with at least one of their picks, stocking the shelves for future years. BenJarvus Green-Ellis has been a strong running back for the Patriots this season, and it's possible that the team would not be looking to land a high-end running back like Mark Ingram. But the Patriots drafting a first-round running back is not unprecedented (Laurence Maroney in 2006) and I think it's a possibility. 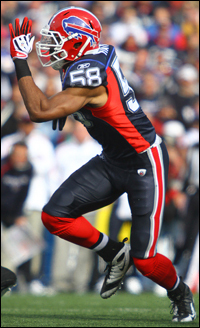 But it makes sense for the team to target offensive line and secondary, though Rutgers CB Devin McCourty has panned out quite well at New England's late first round pick in the 2010 NFL Draft. Lou: Patrick Peterson has declared his intention to leave LSU for the NFL, and at this point he has a slight lead on Nebraska CB Prince Awukamara in the battle to be the first corner taken. The Bills need help on their front seven, to be sure, and it's understandable that Buffalo would try to get an elite playmaker on the line. Marcel Dareus would be a wonderful pickup for Buffalo, though that would mean him falling past Carolina at #1 (he would play DT in a 4-3) and Denver at #2. The Broncos make a great deal of sense for Dareus, much as he would for the Bills. It's interesting the Bills were #3 statistically in giving up passing yards (just 192 yards per game), though that in large part is because of teams early in the year getting big leads against them and then going to the run. In a related note, Buffalo was dead last in rushing yards allowed in 2010 (169.6 yards per game). Third-year Bills CB Leodis McKelvin (#11 overall pick in 2008) finally had a productive season in 2010, starting 14 of 16 games and helping Buffalo make a strong run down the stretch in the latter part of the season. Meanwhile, DE/OLB Aaron Maybin, the #11 overall pick in 2009 by Buffalo, has struggled during his first two seasons with the Bills. He received $15 million guaranteed but to this point he hasn't panned out for Buffalo. So what is the answer for Buffalo if it's not Peterson? Maybe Auburn DT Nick Fairley to play a 3-4 DE, though it would be a waste of his great ability to infiltrate the backfield and hunt down the ball carrier or passer from the tackle position in my opinion. Other possibilities include Georgia WR A.J. Green (the consensus top receiver prospect) and even perhaps a top-flight QB like Cam Newton or Ryan Mallett, though it seems to me that Ryan Fitzpatrick played well enough to earn a shot at the starting slot in camp and that Buffalo would be better off going defense in round one. It's that time of year when you become my go to guy (as cowboys fans, if i remember correctly, a little too early as usual) for all the good solid non biased information. I wanted your input on an ongoing arguement pertaining to Mallett. I think he showed this year he has quite a bit of flaws especially with his footwork, his lack of big time playing in big time positions and his over confidence in his arm all could get him in trouble in the NFL. Now i think his raw shills and size will get him drafted easily first round, but a friend of mine says no way and where i do understand my friends POV on his downfalls I just know the NFL does not learn when it come sto big string talented qbs. What do you think about the big flaws especially the footwork? Also, don't you think Tenn takes a QB either Mallet or Cam with the loss of VY? All that to say, I think Prince falls to the 'boys and he is the pick. Love the site and the picks, I check every day. Thanks. Lou: I'll be the first to admit that I'm a bit more bullish on Mallett than many other draft experts/analysts, but you raise concerns about his game that have not gone unnoticed. With his prototype height and cannon arm, he has the look of a player who could become an excellent NFL player. But that doesn't mean that he needs to improve on parts of his game. Mallett learned in the SEC that overconfidence in his arm could be a bad thing, and it's my opinion that he made great strides between 2009 and 2010 in his accuracy. Mallett showed me in leading Arkansas to a late win at Georgia that he can handle big-game pressure in the clutch, and while he wasn't able to get Arkansas to run the table this past season, he did post a 64.7 completion percentage in 2010. Not as good as Cam Newton or Andrew Luck, but still posting a near 65% completion mark this past year. As for the Titans, I was in the midst of completing my most recent mock (which I had just finished rebuilding) when news broke that the Titans wouldn't be bringing Vince Young back for 2011. Odds are that the team will be able to trade Young soon after they can beginning on February 7, and it will be interesting to see what they can get for him. The Titans have to find someone who can start out of the gates for 2011. Jeff Fisher is entering a lame duck season, making $6.5 million guaranteed for 2011, which is in no small part why he will be returning and VY won't. It's possible that the Titans could snap up a guy like Cam Newton who has shown an exceptional aptitude at picking up offenses quickly, but going with a rookie can be risky. Fisher likely will lobby hard to bring in a strong QB for 2011 since he is in a John Fox type position (who was playing out the string making $6 million in 2010 for Carolina), though Fisher could earn a new deal if he's able to get the Titans in order and have them looking like they did in 2008 when the team went 14-2 in the regular season. Regarding Prince Awukamara, him falling to Dallas is a distinct possibility, with some believing that he could transition into being a solid NFL safety, thus filling a pretty big need for the Cowboys. Dallas would probably be best served to trade down and then take one of the good-but-not-elite offensive tackle prospects if they aren't able to land Awukamara, but as always there is plenty that will play out between now and late April to impact roster decisions for all involved.